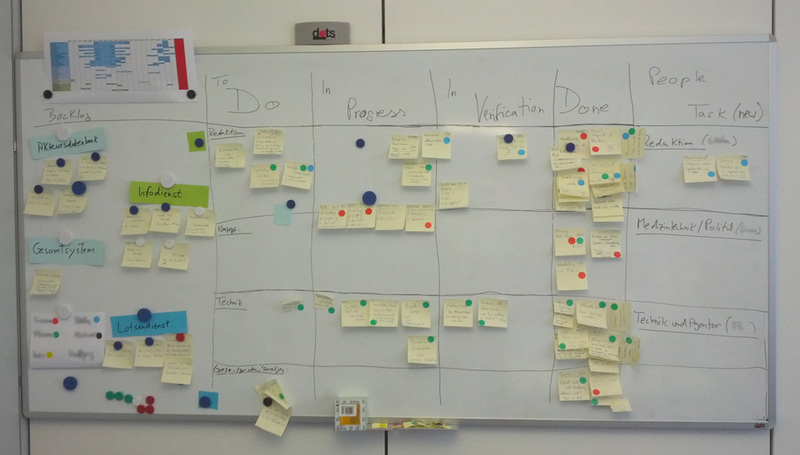 After launching the online guide for developing medical devices, our team had the chance to rest a little bit and dealt with some minor improvements for the platform in general (see our Kanban Board, other inspirations on Agile Board Hacks). We used and adapted the Kanban Board method for our coordination. After some internal meetings with our copywriters and the medical engineering team, we figured out some key features for our new service in a very abstract sketch. The last introduced projects were characterized by its approach of attaching data to a plant. In this project “Charisma Garden” (2013 - 2014), the data will be directly integrated in the health and growth process of a plant. In comparison to the “Travelling Plants” and “Dead Tree Project”, the data is not added to the plant then rather the representation of the data is the plant by itself in this project. In relation to the chapter “3.1. Visualizing techniques with plants” on page 44, the “Charisma Garden” project can be assigned to the category plant displays and takes over the role as a data sculpture. This dynamic (visually changing) data sculpture presents the social activity of a Facebook user. The previous chapter described the artwork “Season Patterns”, which captured natural environmental changes. The interactive relationship only existed between the artist and his surrounding natural environment. In contrast to that, the collaboration project “Travelling Plants” with Juliane Springsguth created a direct interactive relationship between plants and humans as well as between humans and humans.